This barefooted Californian known for his thoughtful yet playful commentaries on issues like the environment and the Middle East understands that allowing his art to evolve into something simple has helped him become one of America's most important musical voices of his time. Michael Franti had been creating music that included the likes of punk, electronica and hip-hop before finding his current voice, a streamlined folk-influenced sound that subtly combines soul, funk and reggae that suitably buoys his left-leaning poetry. Now 41, Franti's days as an underground artist appear numbered -- some find his music and turn onto the words, and others find his music after seeking out his message. And finding new fans helps economically, but also satisfies his hope that his contribution is furthering the causes he's joined. "We get a lot of people who come out to the shows because they want to hear great music. And a lot of those people might differ from me politically. My mission is not just to spread a message, but also hear the thoughts of other people," he says. Franti's profile rose in 1999 when he took a strong interest in politics. The 2000 Michael Franti &amp; Spearhead album Stay Human, the first that also embraced a simpler music but a more serious message, turned more than a few critical heads. 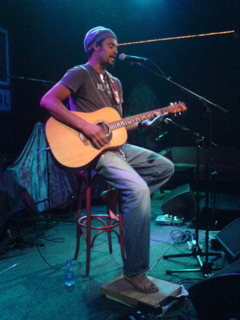 The album featured a more mature and more poetic Franti on issues like globalization and the death penalty. In 2003, the album Everyone Deserves Music raised Franti's profile higher thanks to songs like "Everyone Deserves Music," "Yes I Will" and "Bomb The World." And last year's Yell Fire! was made after Franti's soul-searching trek to Israel, Baghdad, the West Bank and the Gaza Strip, a trip that also spawned his self-produced movie I Know I'm Not Alone. Consider these lyrics from the song "I Know I'm Not Alone": "Every time I read the news, I'm always more confused; They're tellin' me to choose, but there's only lies to choose from; And how many died today, How many lost their homes or shot a gun; Or a loved one, What happened to our sons." While not exactly a darling of the mainstream media, Franti travels the world on the festival circuit and is also known for producing the annual Power to the Peaceful Festival in San Francisco. Franti believes many things prompted the evolution of his sound and his maturation as a lyric writer -- his growth as a musician, his discovery of difficult news from around the world and a more serious desire to share his words with his audience. He's also discovered that balancing sometimes dour subject matter with a positive outlook helps him reach his fans. "With social commentary, I'm always trying to find the best way to say it and leave people uplifted -- to bring things down to one phrase or one melody and get it so that it's understood by people takes time and understanding on my part," he says. "I've found that I'll work on a song for months, and decide there's one really good part of the song. So it's a matter of peeling away all the layers and turning the rest of it into something that works." And even when he writes a song that might steer away from a serious message, he makes sure his voice is heard. "Music is a healing art. When I play music or when I hear music, it helps me get past those difficult times. And then ultimately, trying to keep a sense of humour and finding laughter and joy in everyday parts of my life."